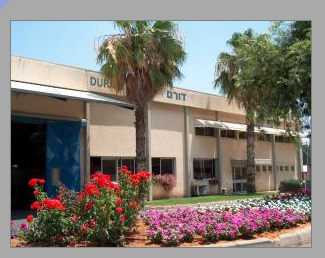 Established in 1968, DURAM RUBBER PRODUCTS is located in Israel's central northern region. With over 37 years of experience in manufacturing a wide range of technical rubber products, the company has become an important source for the agricultural, electronics, construction, safety and security industries. An ISO 9001 approved company using state-of-the-art technology, DURAM RUBBER PRODUCTS abides by a philosophy of maintaining close ties with its clients and paying attention to the feedback of its end users in order to continually develop and improve its product line. Only high quality materials, including natural rubbers, NBR, neoprene, silicone, Viton® etc. are used and production is done by modern, computer controlled injection machines and supervised by a fully equipped laboratory. Many of the products meet international standards such as ASTM International and DIN. DURAM RUBBER PRODUCTS are exported to many countries all over the world and are well known for their high quality and durability. If you would like more imformation about DURAM RUBBER PRODUCTS or our services please contact your nearest representative.